Kwik! Get in teh car! Ohai to annipuss adn poussinboi adn Elsa Mama adn congas on owr brayd. Wo0t! Ohai, WRr! Ai gotted cramps in my finners just watchin teh bideo. Naow whare am dem marshemallowz u sed waz heer? Marshymellowz? *Mouf wadders in antissipayshun ob s’moars* Ai can halp mayk? Plz plz plz? Yoo furgot to hied teh string. Lookout, PB! AP spotted teh stwing! o.O ……. Ai wuz twi-‘n tu hide it !! 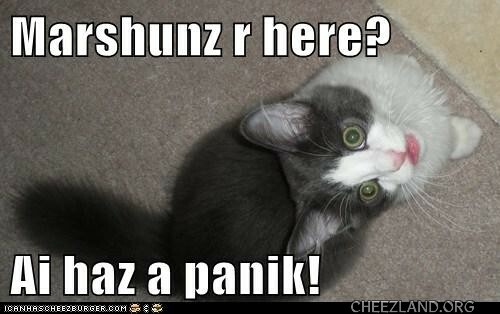 Kwik get dat kitteh a flannik! Ai hazza a panik adn a nunsertin. Adn a hongreh. Duz dey tayst gud? Pleh. Tuu much furz, nawt enuff meets. Lizzerdz betterer. Da greenee wunz tastee lik boogerz; but da purrpolol wunz be gwape! Uh Oh — now da Marshunz iz all cubbered inna kitteh hares an iz libbin unner da frigermatator! Be cayrful ob teh orinj wons. . .
u has bin lissnin to orson welolles? heers teh burfday fairy to say HAPPEE BURFDAY to ImLink, Kellyfur, Blueguitarblues92 an evreewun else hoo haz a burfday today! i haz bringd yummy fudjy burfday caeks, anjel fud caeks wif fresh froot an wippy creem, iskreem, sparkly party punch, fansee shiny party hats, an goodie bags filled wif outer space snoglobes, remote control toy spaceships, kandee, an shiny glo-in-teh-dark space alien stikkers! an a big swish ob teh burfday wand to making all yor burfday wishes come troo! Hey PB — is eezz, just startz pushin awlla da buttonz!! AAAHHHHhhhhhh… DUCK!! *zoooommmmmm ….. * Whew, I fought we wuz gunna hitz da duck — he nawt filed a flite planz! Ohai, burfdayfairy. Happy burfday to awl teh peeps sillybraytin tudai. Ooooh, burfdayfairy, yoo alwais brings teh gud stuffs. Mine has teh itteh bitteh Ennerprize inside. Kewl! Ohhhhh….. CB derz a remote control toy spaceship! Less go furr a fly!! Weeee…. wee bee flyin!! *Loopididty Loop* Weeeeeeeeee…. Howz yoo bee CB? Wanna turn wiff da stikky fing!? Hey der AP, wear did yoo kums frum? Didja see dat duck? Iz otay AP — CB jumpid owt- sew derz plentee ub rum furr us!! Here wanna dribe? WOW a purrfect elebenty pointee landin!! gub jobs der AP!! *slides AP sum fudgy caek an sparkloly punch! Any landing you can walk away from, Fred. Mebbe ai duzzunt want to get smakked up sied teh hed agin. Dat wuz AP dat smakkid yoo yessterrdae! Nawt mee …. Wuz yoo dat handed me teh frozee pee. Harumpf. Dat wuz jest a miss kom munnie kashun!! Wuz peAs nawt peE! Ai wuz sittin in teh dark watchin dem chop up a tree! Ai gnu it wuzzunt yoo. Why teh tree felled down. Was it windy, or was teh tree just tired? It had juss raynd, adn wuz kynda windy. It wuz a big blakk akaysha tree, adn papa had bin watchin it askanss fur munffs nao. It wuz reely big adn hye, adn wuz leenin ober teh street kuz it wuz growin negst tu a fyoo obber big treez, so dat wun syde ob it got awl big and leefy adn hebby. Papa wuznt tuu wurreed, tho, cuz it wuz aymd at teh nayburz haus, nawt owrz. Adn teh powur lynez adn teh nayburz tree kept it frum fawlin alla way daon ennywayz. Der wuz a gye wiffa kamra, so papa went tu tawkin tu hims, adn it turnd owt hims wuz frum channlol-2 nooz (ktvu). Hims wuz a loklol adn stoppd bye tu chekkin it owt. So hims askd papa sum kweschunz on kamra, adn dat nyte papa watchd teh nooz adn hims mayd it on TB! Wuz only bowt free sekkunz ob him tawkin (juss enuff tu sez der wuz a flash-boom den teh powur went owt), but den dey showd teh tree wyol teh ankur tawkd bowt it fur a fyoo moor sekkundz. Teh gye had bin waytin fur it tu shift or fawl, or for teh gyez tu kuttin it up, but PG&E tuuk furebber tu show up adn grownd owt teh wyrez, so it wuz gettin dark by teh tyme teh tree gyez got tu wurk. Myta gottin moar ayr tyme obberwyze. I fot AP sedded dat dere wuz a guy wiffa kaRma an I iz finkin, dont we awl hab karma uv wun sort or anudder? It wuz AP — yoo madid a silleh commint about alla Angol babbehz skratchie fingies and she smakkid yoo! Wee all know she likee ta smak peeplolz! Ai nawt smakks pplz! *swat! * Ai swats dem. Ohai, naybur! Dat wuz a big tree, huh? Ai wunner wye dat iz! Ai wundered boat yur abatar, thote it wuz juss mai kon tack lenzzezzz. No dat da Lady Jane’s hed frum a piktor ub hers flipped ober showin her belleh. She haz long wite belly hare so she luks kinda like a squashid bug. We..e..ll, goggies can get a bit 2 boysteruss fur a kitteh sumtiemz! Wood yoo like to hab sum fudgy caek wif mee? Shoor. Heer’s teh isee kreem to go wiff. *Wanders bakk in, tayks a slyss ob fudjy caek, cubbers in fresh froot, den skwirts wippy creem on top* kshshshshshshshshshsh Aaah, dat’s teh gud stuffs! Why awr yew afraid, liddlol kitteh? Didja fink dey braut curiosity bak wif dem? Don’t worry, dat’s jes an eggspresshun. And befoar yew ask, no it’s nawt dat kind ob rover either.